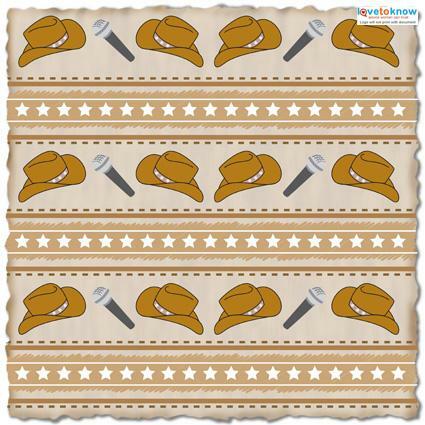 Scrapbook paper with a country music theme is the perfect backdrop for concert photos, tickets, stickers and other commemorative items from your boot scootin' music events. You can make your layout using free printable paper designs or purchase paper from an online retailer. 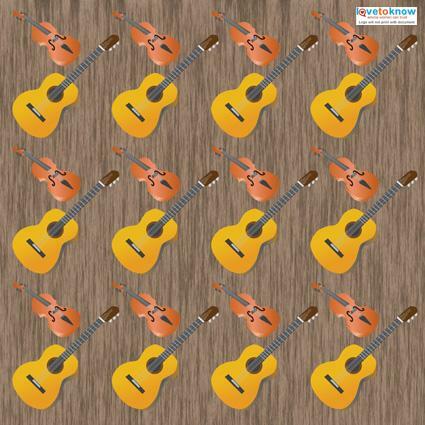 The following scrapbook paper designs are available as free PDF downloads. Click on the link or image of the paper that you like to open the file, then save the file to your computer. When you're ready to print the design use acid-free paper so that it will last longer. You can experiment with different types of paper to create various effects on your layout. Try printing on glossy photo paper, transparent vellum, and textured cardstock to see what look you like the best. If you need help downloading the paper, check out these helpful tips. Download this country music paper. Scrapbook.com has a number of western-theme papers that would coordinate perfectly with a country music page. Some to consider include this rustic wood pattern and this hat and boots paper. OrientalTrading.com: This popular craft site sells an adorable 97-piece western theme scrapbook paper kit, which includes dozens of 12 by 12-inch double-sided scrapbook paper that can easily be used as the backdrop to country music themed projects. Scrapbook.com: This site has a Western section that includes paper packs as well as individual sheets. The pink-hued Country Girl is one very unique option. 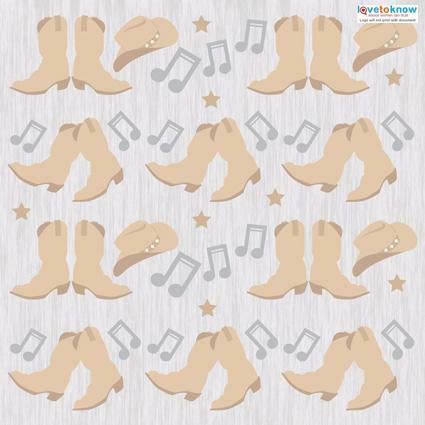 Scrap Your Trip: This site has a music section with a few country music themed papers and embellishments. The key to making a memorable scrapbook page is to use your imagination. Display your best photos next to pretty patterned paper, some bits of rope as a border, and cowboy boot stickers in a two-step or line dancing pattern. You could also try adding some fringe, string ties or swatches from a bandana to create a special scrapbook layout.